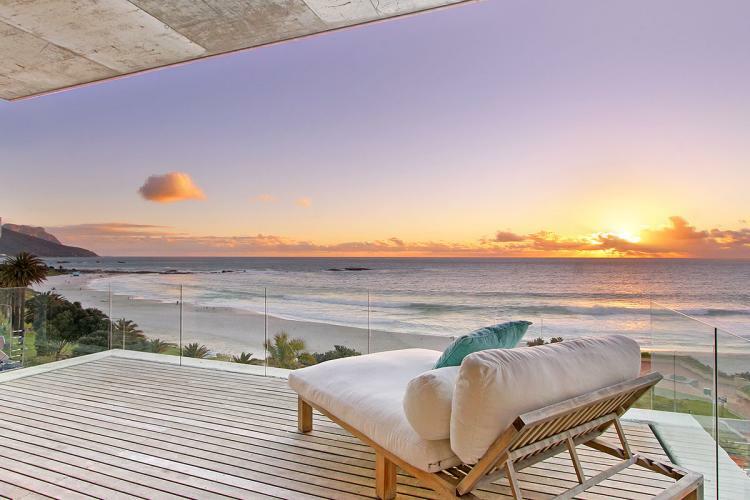 Fall hopelessly in love or re-kindle that connection in one of these fabulous sea-facing Camps Bay apartments, with stunning pristine white beaches, clear waters, panoramic sunsets over the bay, and a strip of bars and restaurants providing exceptional food and cocktails right along the beachfront. In Cape Bay there is a sense of luxury, relaxation and romance that rivals many tropical destinations, with the added benefit of the magnificent city of Cape Town around the corner, as well as the sister beachside destination, Clifton, as neighbour. Add to this list the steep, vegetation-lush surrounding mountainside offering breath-taking bay views, you’ll find Camps Bay truly is the idyllic fairy-tale setting for romance and holidays. There are many self-catering accommodation options here, which offer a wide range of features to suit every couple’s desires. From chic, modern apartments to luxurious Camps Bay villas with delightful gardens, to beach bungalows a mere stone’s throw from the sand, there is something for everyone. Of course oodles of privacy, a luxurious bedroom, impressive architecture, swish decor and possibly a Jacuzzi are equally integral to this fanciful experience. Nothing stands between you and the ocean at 15 Views, where views surround you from all corners. This contemporary penthouse is an elegant piece of modern architecture, with minimalist open plan spaces and a beautiful wooden balcony (with a lovey Jacuzzi). African artwork brings dashes of colour into the home, which is otherwise white and calming. 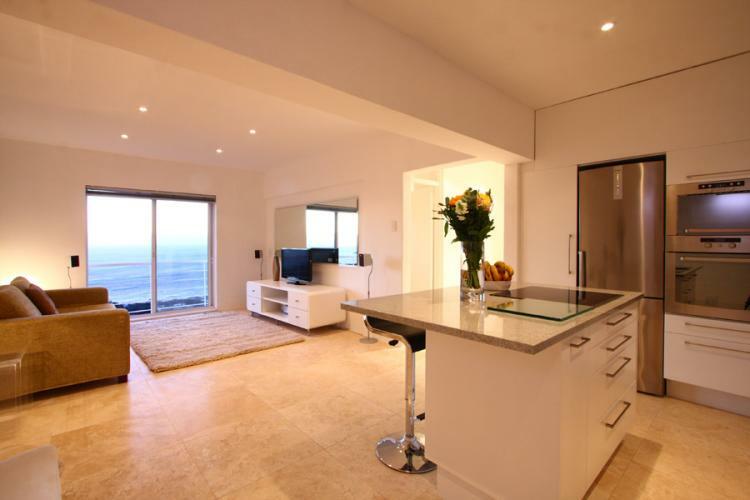 The penthouse overlooks Victoria Road, the main strip of Camps Bay where couples can indulge in all the culinary delights of the many restaurants and bars, after a dip in the ocean next door. Within safe and quick walking distance, the palm-fringed beach can be couple’s number one area for spending time together if they wish, before or after relaxing in the indulgence at 15 Views. The Clifton beaches and Cape Town CBD are also five minutes away. This four-star penthouse is perfect for couples, young and old. The penthouse is owned by a former rugby player, and has an impressive collection of paraphernalia along the stairs, which will intrigue any rugby or South African sports enthusiast. An eight-seater dining table provides an opportunity for having guests under a magnificent chandelier, adding a touch of star quality to the house. The lounge area includes an L-shaped couch and two plush chairs. The kitchen opens to the large balcony through a breakfast bar. The bedroom (with open plan bathroom) is flanked by an enormous window presenting the beautiful Twelve Apostles mountain range. The whole room has an opulent, heady, romantic atmosphere. For something a little more low-key but equally lovely in its own way, is the atmospheric, intimate, home-away-from-home Geneva Low apartment. This apartment has a lovely lush garden, and feels like the perfect retreat to hide away with a lover after a busy holiday day. Geneva Low will soon have a swimming pool, which will be shared only with the apartment above, and the double bedroom is spacious and furnished generously. Couples can take a quick stroll down to all the boutiques, shops and bars, and come home to a well-kitted kitchen with a range of tools to create a romantic dinner to enjoy in the garden. This quiet, private studio apartment is a beautiful, simple space for couples looking for a little retreat. With lovely sea and mountain views (watch the 12 Apostles mountain range shadows dance), the modern, stylish space offers everything you need in self-catering accommodation. Stand at the balcony and be right on the sea, or let the salt spray air breathe into the space as you relax in the living room. Active couples will love the fact that the space has store room for surfboards, bicycles, etc; and is a short drive from beaches, city, and bar/restaurant stretch. An enclosed private balcony is the perfect place to be left alone with your partner to relax and take in the exquisite views, without being troubled with a gust of wind. The bedroom opens to this balcony, as does the lovely lounge which is equipped with flat screen TV and DSTV; a gorgeous carpeted space with large couch – perfect for some romantic movie nights. There is also wireless internet and desk for those wanting to connect. Relax on the bed upstairs on the balcony all day if you feel like it – or watch the stars. Or take your lounging into the bath where a lovely generous tub with headrest awaits. The kitchen here is immaculate, and the security and privacy are top notch, as the apartment shares an entrance with only one other apartment. This exquisite apartment will make you and your partner feel like captains of the sea, with enormous full-wall glass on one side right on the water. Watch the ocean change as you lie on a beautiful couch and take full advantage of everything this magical place has to offer. Move on to the terrace to enjoy the fresh sea air or take a dip in the large pool surrounded by a beautiful garden. The apartment has a private entrance and is only 10 minutes away from the city centre, V&A Waterfront, and 5 minutes from the beach. 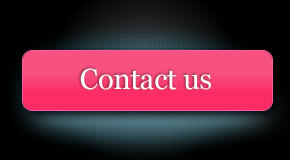 The apartment sleeps two and is available on a daily (minimum 2 days), weekly, or monthly basis. Enjoy free access to the private gym on the property, or indulge on Pilates and Thai massages (at surcharge). 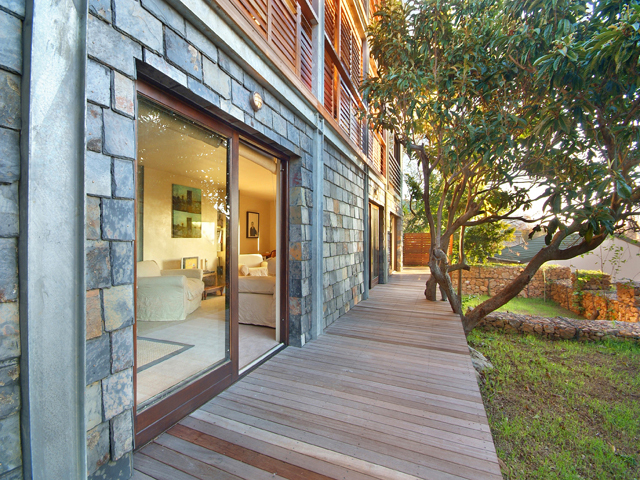 So, these Camps Bay apartments are your five reasons for taking your loved one to the beauty of this Cape Town holiday suburb. 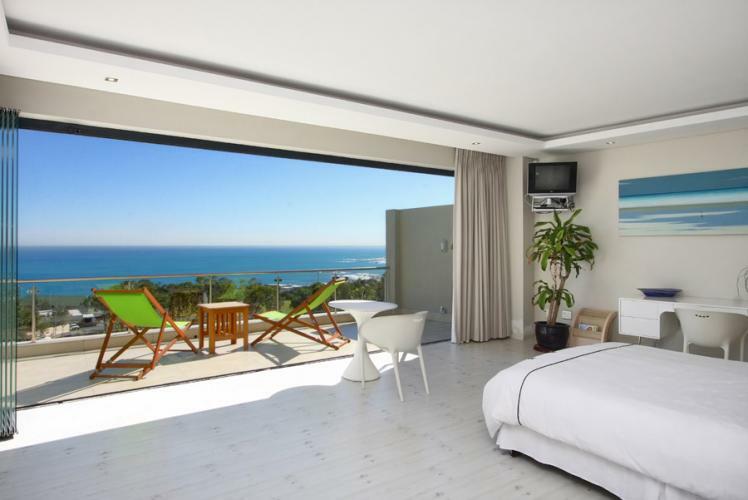 Make sure you retire to one of these fantastic Camps Bay apartments, for a truly exceptional holiday with your loved-one. 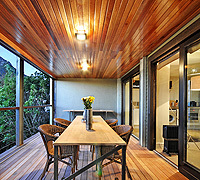 Visit Villas Camps Bay, for these and more Camps Bay Apartments. 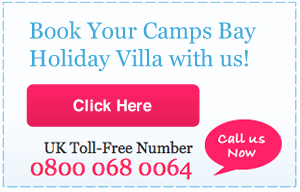 Holiday Villas in Camps Bay provides upmarket holiday accommodation in one of Cape Town's, if not South Africa's, most exclusive seaside suburb, Camps Bay.